It was announced today that: "The Internet Explorer team is excited to announce that web-development support is moving to Stack Overflow." A lot of questions that would be appropriate for a support site are not appropriate for SO. Presumably the previous discussions on this problem are still applicable? Is this an official partnership? I'm guessing not as there would probably be an announcement about it here, so can someone 'reach out' to Microsoft and suggest that they might want to clarify what types of questions should be asked on SO, rather than inviting all questions be asked. Am I tripping? Seriously, one of the largest software companies in the world is pointing its customers who want support to an external website that it doesn't control? Previous discussions sampling: Why we're not customer support for [your favorite company], Third-party development support: hosted by Stack Overflow, Reach out to Instagram about outsourcing their customer support to Stack Overflow etc. Exhibit A for an inappropriate question, that the asker has been lead to believe is appropriate to ask. I wanted to chime in and try to answer some of the questions being asked, as well as ensure everybody that my goal is not to harm the quality of information on Stack Overflow in any way - I've been a long-time user/contributor/moderator, and have only the best intentions. A lot of questions that would be appropriate for a support site are not appropriate for SO. Possibly, but the Web Development forum that we decided to close should not provide too many instances of this. In the announcement I shared a link to the Stack Overflow tour; my expectation is that people coming to Stack Overflow will learn, and play by, the Stack Overflow rules. We've seen enormous success here keeping discussion/hashing in the comments, and solutions in the answers. I don't expect this to be a problem for engineers coming from MSDN. Is this an official partnership? While we have official relationships with Stack Overflow (we sponsor the Internet Explorer tag, for instance) this particular gesture was unrelated to any official partnership. We simply went the way many before us have gone, including the YouTube API, Windows Azure, OneDrive Development, etc. ...can someone 'reach out' to Microsoft and suggest that they might want to clarify what types of questions should be asked on SO, rather than inviting all questions be asked. We aren't inviting all questions; we specifically chose the "Web Development" forum as our target. The questions asked therein will be web-development related. If they're not, they'll be handled appropriately by the Stack Overflow community. Why would you not want more developers contributing to the general body of knowledge here on Stack Overflow? Seemed like a good idea to me. I read the blog post. Seems like they understand the ethos. It remains to be seen if they do keep up with related tags. We do understand the distinctions between the two communities. In fact, for anybody on my team that wants to brush up on Stack Overflow, I'm going to personally deliver a training internally on it next week. Our goal is to contribute positive effort into this community - I will personally be involved from here on out. I wonder if it might be better to have a new dedicated network site for this in the long run. I don't think this would be a good idea. The forum we are closing is the Web Development in Internet Explorer forum. The types of questions asked in there are already being asked on Stack Overflow. By closing the MSDN forum we reduce the redundancy on the web, and encourage a community of very talented engineers to contribute to an even superior platform - Stack Overflow. I think having the Internet Explorer team monitoring questions/answers and providing their expert advice/answers is a benefit to the community. I do too - our team has a deep and intimate working knowledge of not only our browser, but browsers and web-standards in general. As an example, I happened upon a cross-browser interop bug yesterday on Stack Overflow and proceeded to reduce it to a fiddle that I could share with a team member. Within seconds of looking at the fiddle, the team member identified exactly what the root of the cause was, noted that it was a regression, stated the difference between how we do it and how Chrome does it, and suggested a simple work-around. That is not the type of knowledge you'll find with your average web-developer, but it is the type of information you can expect from browser-engineers themselves. I am excited about seeing fewer "Ugh. IE. FML." responses, and more responses from people who have an intimate working knowledge of what is actually happening, and can give a real solution to obscure problems. Please note that Jonathan Sampson is no stranger to SO and knows very well the limits of topicality. Probably he forgot that not all the people who will read that announcement do. Also, that they aren't outsourcing their support. Many of us on the Internet Explorer team have been using Stack Overflow for years, and are committed to watching incoming questions very closely, offering timely support, and actively maintaining the Internet Explorer tag itself. What they are effectively outsourcing is the Q&A platform. Which is a good idea. I tried MS Forums, but they weren't as good as either the newsgroups they replaced or SO. Pouring resources (in this case MS employees to answer questions) into the superior system is the right choice, IMO. And SO benefits from the increased traffic and answers. Finally, notice that internet-explorer IS a sponsored tag. So there is an official relationship. I'm a little scared of this, at a glance. SO questions can already get rough at times. In the short term I am interested to see if this brings in new, interesting users and content, and to observe and see how it goes. But, I wonder if it might be better to have a new dedicated network site for this in the long run (after some observation for a while, of course). Another thought I want to add is a concern over the interaction in the "Exhibit A" example given above (screenshot for those of you under 10K). Regardless of whether or not it is felt that this was on-topic, the reaction to that is concerning primarily because the OP was led to asking that question here, and expectations set by the IEDC post were not met. Mismatched expectations are a significant source of conflict in general. There will certainly be some "culture shock" for incoming users to deal with and it's probably best to resolve all feelings about these types of questions now before it starts, so that at the very least our community can have a consistent reaction (inconsistency is another source of conflict). There is potential for great hostility there. 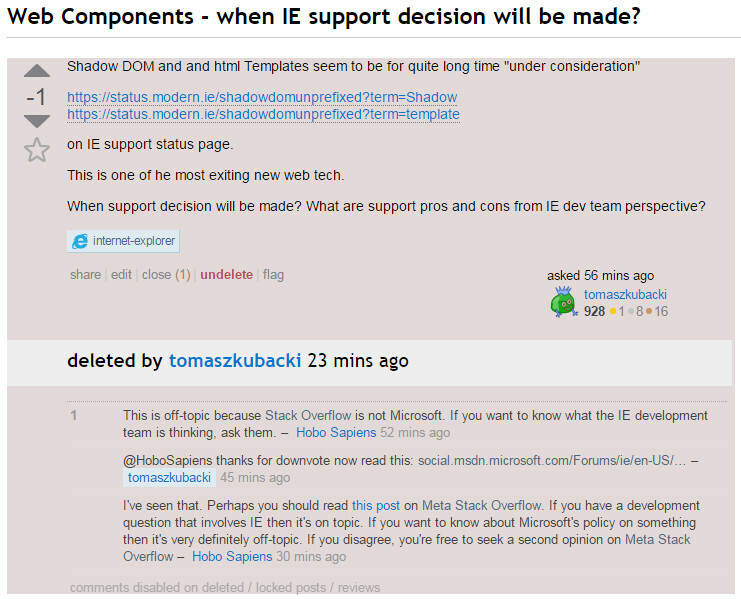 Microsoft moving their support to Stack Overflow is not an “official” partnership. Yes, they do run banner ads with us and sponsor their tags, but that is an advertising commitment, not a partnership. I think the takeaway from this announcement is that companies realize the power of the Stack Overflow community and want to provide support where their customers are looking for it. As our mission is to make the Internet a better place to get expert answers to your questions, I think having the Internet Explorer team monitoring questions/answers and providing their expert advice/answers is a benefit to the community. We make every effort to ensure that companies provide guidelines on their support pages, but we can’t make sure that every visitor to their site follows the rules. I’ll discuss this further with the community team and see if we can determine some best practices to share. Feature requests should still be routed through http://uservoice.modern.ie. Bugs and issues will continue to be filed online at http://connect.microsoft.com/IE. These are the biggest concerns to doing these kinds of 'offloaded support' deals: that meta issues end up on main content channels. But they seem to have their bases covered. In fact, the only questions that should be coming here are questions that would have been coming to the channel they're closing. The meta topics should have been going down the meta channels they were before. He was a SO moderator for a number of years. I doubt he's forgotten what kinds of questions belong on SO and what one's don't. They're already moderating the tags, and if this is their official move, I personally have faith they will continue to monitor those tags. (Although, admittedly, it would be easy to say you'll monitor them and just let the community go to work on those questions. SO certainly has a vibrant enough community to absorb them.) I have confidence that the meta issues that would have been moderated via their old solution will continue to be handled by those same people, it will just be on SO instead of their old channel. The biggest hurdle I see is SO-ifiying the existing userbase. When I look through the old content, I don't see a Q&A site, I see a forum. Discussions. The information exchange occurs differently on SO by design, and it will take some time for battle-hardened users to adjust to that change. But this is no different than the multitudes of existing new users we get from other sources: they just need patience and some close votes when necessary. In another important note... the existing forum they're using has a little over 16k posts in 7 years. That's 6-7 posts per day. The internet-explorer tag has an average of 17 posts a day over the past year, and that doesn't count ones that perhaps use internet-explorer-8 without the generic tag. In other words, Stack Overflow is already at least 2.5 times more active than the channel they're closing. I'm seeing a lot of pros (more active expert answers attracting more expert questions and more real world problems of real life developers getting solved) and honestly very few cons. When I look at all the facts in perspective, I don't see what the worry is. Not the answer you're looking for? Browse other questions tagged discussion outsourcing . Are Google and Stack Overflow partners? Is the SO link on Modern.IE officially approved? Should FreeLAN or other projects pay Stack Exchange for redirecting support to Stack Overflow? How can I get support on Google's Progressive Web Apps?